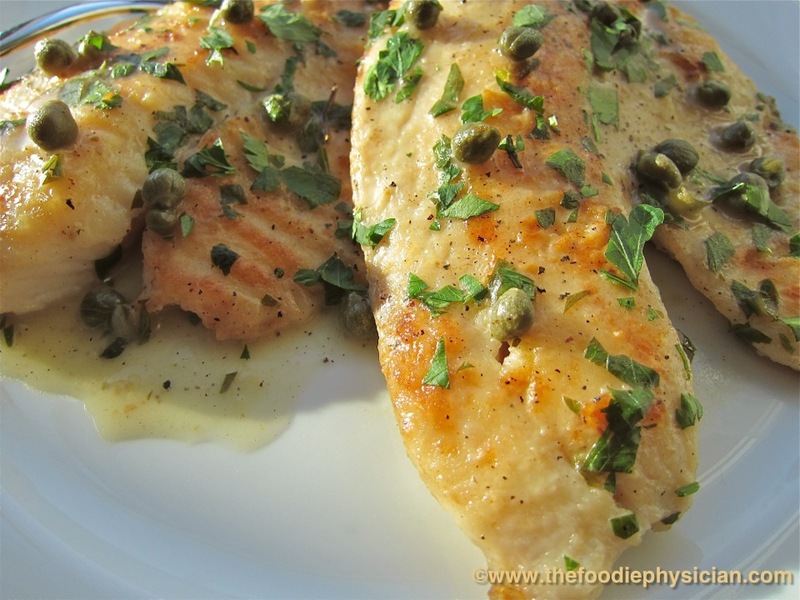 This dish is my spin on a traditional Italian dish, chicken piccata, which is chicken cooked in a lemon butter sauce and topped with briny capers. It’s one of my favorite chicken dishes to order at Italian restaurants and it’s actually quite easy to make at home. To put my own twist on it, I decided to make my version with tilapia instead of chicken. I’m always looking for ways to incorporate seafood into my diet and I like to use tilapia because it has a mild flavor and is readily found in grocery stores. It’s also a fairly firm fish so it won’t fall apart while you’re cooking it. Most traditional piccata recipes call for large amounts of butter since it adds flavor and it helps to thicken the sauce. This is a common cooking technique- in French cooking it’s called monter au beurre, which means to finish or “mount” a sauce with butter. It’s done by swirling pieces of cold butter into a sauce at the very end of the cooking process to give it a glossy, velvety texture and rich flavor. To cut down on the amount of butter, I add a small amount of flour to the sauce to act as a thickener while it reduces. Unlike most recipes which often call for several tablespoons of butter, I swirl in only 2 teaspoons at the end- just enough to add delicious flavor. This is a simple yet elegant dish that will only take you 20 minutes from start to finish, so it’s perfect for a quick weeknight meal. It’s a great way to get your family to eat seafood but the recipe is easily adaptable and works well with thin-cut chicken breast or pork tenderloin. It’s perfect served over a bed of angel hair, risotto or mashed potatoes to soak up the lemony sauce. 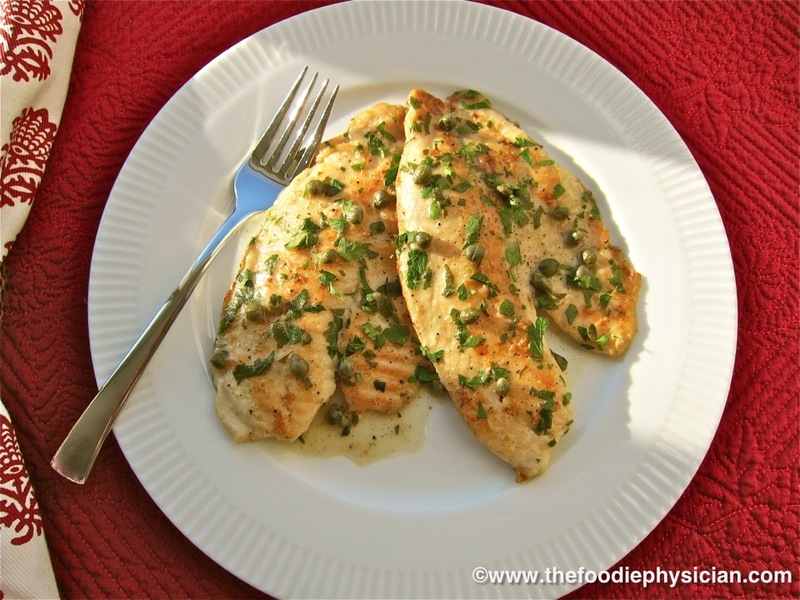 This dish is my spin on a traditional Italian dish, chicken piccata. You can substitute any flaky white fish for the tilapia, if desired. Whisk the chicken stock, lemon juice and 2 teaspoons flour together in a measuring cup. Set aside. Season the tilapia with a pinch of salt and pepper. Place the remaining ¼ cup flour on a plate and lightly dredge the fillets in the flour on both sides, dusting off any excess. Discard the extra flour. Heat the oil in a large skillet over medium high heat and add the fish. Cook until golden, about 3 minutes, then carefully flip the filets over and cook another 3 minutes on the second side. Remove the fish and place on a plate. Add the garlic to the skillet and cook 30 seconds until fragrant. Add the wine and cook until reduced by half. Then, pour the chicken stock mixture and capers into the skillet and cook until the sauce thickens, 2-3 minutes. Lower the heat and stir in the butter and parsley. Return the tilapia fillets back to the pan and spoon the sauce over them. Cook another minute until warmed through. Garnish with extra parsley before serving. For nutritional calculations, I did not include the full 1/4 cup flour used for dredging the fish but rather used 2 tablespoons, which is the amount of flour that adhered to the fish (the rest is discarded). What is your favorite dish to order in Italian restaurants? How do you like to prepare fish at home? Leave a comment below and let me know! Looks really good and its realtively easy to make at home! Thank you! Yes, it's very simple to make so it's one of my go-to quick weeknight meals. Thanks so much! I'm bookmarking this and will definitely let you know when I make it..Keep em coming!!! Thanks, M.J! Do let me know how it turns out if you try it. Dr. I love the recipe but the nutritional info does not include sodium content. Is that missing from all of your recipes? Hi Deborah, thanks for stopping by! This is an old recipe- we’re in the process of updating all of the recipes on the site to include full nutritional information including sodium. I’ve updated this one for you now. I hope you try it out! hi doc, you make it look and sound so easy,I am definitely going to replace the chicken with the fish. So healthy too. Our favorite Italian restaurant food is shrimp scampi or chicken picata.Never realised there is so much butter in the restaurant dishes. Thanks! I love shrimp scampi too but it also has a lot of butter like piccata. You can cut down the amount of butter in the sauce by adding a little flour to thicken it, just like I did with this dish. What a wonderful variation. I rarely cook with tilapia, but will make a point of making this recipe. It looks delicious. Thanks Lynda! This recipe would work well with almost any kind of fish. YOur tilapia looks excellent, and I love your photos, very clear. This recipe is something close to what I have been meaning to try, thanks for sharing! Thanks for your comment, Laura! Please let me know how it goes if you try it! Good morning! I just wanted to let you know that I shared this recipe on my weekly seafood roundup. Thank you for allowing me to share! oh yummy!! i am making this tomorrow for our Sunday dinner. Thanks so much!! Thanks, Carla! Let me know how it goes if you try it! Wow, looks great. I will definately be trying this. I even think my picky teen will like it. I used to eat a similar dish at a restr. in the South. It was made with catfish and had little chunks of lemon and tomato as well as the capers. I'm thinking it will be even better with Tilapia. Can the white wine be substituted with something else? Yes, you can use extra chicken stock if you don't want to use wine. I hope you enjoy it! Glad I found your page, this dish is awesome and so easy! I look forward to trying more recipes from you. Thanks for sharing. This was SO good and love how healthy it is while still being so tasty! Thanks for posting. I'm keeping this in my recipe box as a favorite. I liked my plate clean!! That's awesome! Thanks so much for stopping by and letting me know! Oh my goodness. This tilapia was incredible!! So flavorful and buttery! My toddler was scarfing down fish like there was no tomorrow 🙂 Thank you for this wonderful recipe we will make over and over again! This is my favorite recipe! I saved it on Yummly about a year ago, and I still make it regularly! Every time it is perfecto. Both my husband and I love it! Tonight, I tried making it with salmon and it was amazing! Thank you so much and please keep posting recipes!